Serendipity has been a recurring theme throughout the life of Studio Table. Heather and I happened to meet when we moved into the same apartment building in the Mission District. It was an unlikely friendship; we come from different backgrounds and work in different industries. Without a chance encounter in the hallway, we probably would not have met. In another stroke of serendipity, we found our first chef when he overheard us at a cafe talking about our plans to start a dinner series. Getting this idea off the ground has taken a lot of work, but we have also been the beneficiaries of luck and chance encounters. We can’t force good fortune, but we host these experiences in hopes of giving people a space to meet, connect, and have their own serendipitous encounters. And now, the latest in our series of happy accidents: Shortly after I returned from a trip to Morocco, I met two incredible female chefs and best friends, Chef Kristen Berlangero (KB) and Sous Chef Nicole Erickson (NE), through a former Studio Table guest. Chefs Kristen and Nicole met working the kitchen at Mourad, the famed Michelin Star Moroccan restaurant, and as soon as I met them, I knew we had to find a way to work together. They are charming, fun, and of course, dynamos in the kitchen. Women chefs are rare in the food industry -- only 22% of chefs and head cooks in the United States are women -- and we are proud to have these badass ladies lead our kitchen team. On top of their many accomplishments, these women are such a delight that we wanted you to get to know them with a little Q+A. How did you get your start in food? NE: As I bartended my way through college, I noticed myself lingering in the kitchens. It wasn’t until after I graduated and became an office manager at a construction company that I realized the bulk of my time outside of work was watching Food Network and reading cook books, and the best part of my day was feeding my friends and family. I took a leap of faith and I decided to go to culinary school at San Francisco Cooking School and the rest is history. KB: I began cooking from an early age. I would always watch and try to help my mom and grandmother. I also enjoyed a ton of Food Network growing up. I would have been totally fine with that being the only channel on the TV. Pursuing a career as a chef seemed inevitable! KB: Nicole and I met when she started at Mourad restaurant as an intern from the San Francisco Culinary School. I trained her on Garde Manger station, where she excelled and stayed on as a Chef de Partie after her internship. Aside from her natural talents, Nicole was an amazingly up-lifting person to be around. She always had a smile on her face, no matter what she faced. After we separately left Mourad, we became fast friends! NE: When I arrived at Mourad straight from cooking school, I was nervous. Yes, I had eaten at Michelin star restaurants but never WORKED at one. Kristen was my Sous Chef when I started on Garde Manger, she put her all into making sure that I absorbed every bit of valuable knowledge she bestowed upon me. She was such a great example of what a strong woman in a kitchen could be and I secretly aspired to be just like her. How did you get involved with Studio Table? NE: I randomly met Michelle Wei through a mutual friend and I’m so incredibly happy I did! Meeting other women doing what they love and doing it well is super inspiring. Heather Day is an incredible artist and the idea of pairing food and art is such a natural combo. It feels great to be a part of something so special. KB: When Nicole and I first heard about Studio Table, we thought it would be a great opportunity for us to collaborate on a project with them. Combining art and food doesn’t happen much in the restaurant world. Once we met Michelle, Heather and Lauren in person, we realized what a truly amazing and compelling concept they had engineered. The collaboration of many talented individuals, excelling in their particular field, coming together to create an inimitable and one-of-a-kind experience. We feel so honored to be able to work alongside of such a remarkable group of individuals! What inspired the menu for the luncheon at Provenance Vineyards? 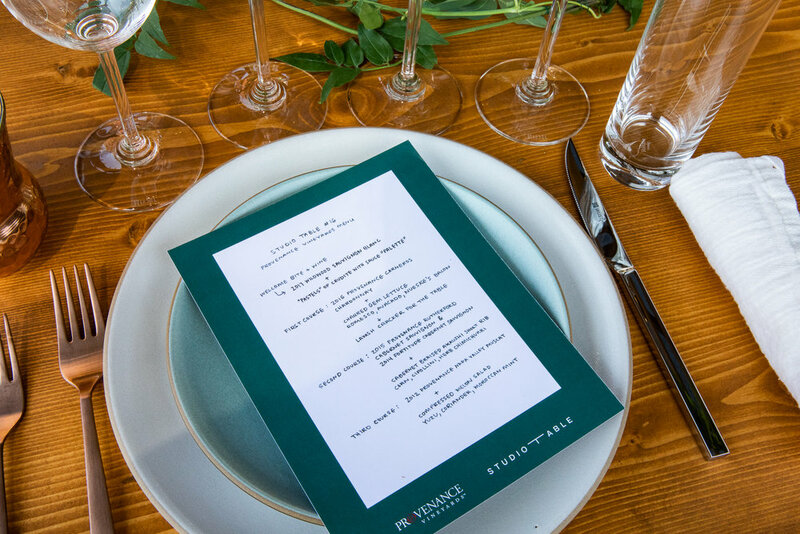 NE: The menu was inspired by a combination of using seasonal fruits and vegetables while trying to create abstract plates and pair accordingly with the delicious Provenance wines! Sitting down with the team in Heather’s studio helped us understand what makes Studio Table special. We were inspired by her use of blocks of colors as well as wandering lines. The crudités dish in particular came from Heather commenting on how beautiful she felt her overflowing box of various-colored pastels looked. We wanted to emulate the look of it, but also deliver on flavor! What does bringing together food and art mean to you? KB: When we put together the menu for this luncheon, we were not trying to replicate Heather's art in any way. We wanted to capture the essence of her art by playing with a variety of shapes and angles on our dishes. The smear of avocado puree goes in one direction, while the swoosh of romesco sauce goes another. We wanted to make food that looked beautiful, and also tastes beautiful! NE: Another dish that was inspired by Heather’s artwork was the compressed melon salad. It looks like it would just taste of melon, but by compressing that melon in Moroccan mint tea, we were able to coax a new depth to the sweetness out of the watermelon. Then we added pops of flavor and texture with the coriander blossoms and coriander-candied pistachios. It’s similar to how Heather’s paintings have a sweet and tranquil quality to them, but they are also punctuated by other textures and colors to add excitement and even a little danger. Anything final thoughts on our first event together at Provenance Vineyards? KB: I want to relay our appreciation and excitement to be in a creative space with such a dynamic group. This is the start of more collaboration projects and making people excited about art x food x conversation x experience! Thanks, team! Want to join in on the next Studio Table community event? Introduce yourself here. Written by Michelle Wei and Victoria Chao. Photography by Grace Sager.